Summary: Conflict happens in all relationships, but especially marriage. We are in our 4th week in a series called First Love. 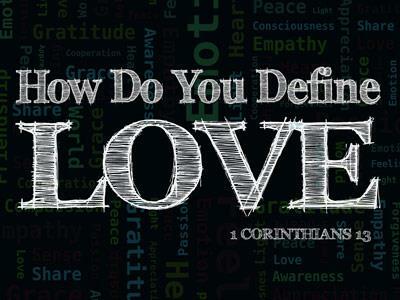 We are studying the New Testaments’ classic passage on relationships, Ephesians 5:21–32. Eph 5:21–32 is specifically about marriage and singleness, but Paul says these things are really just windows into our hearts, so we’re learning principles that apply to us whatever marital status we are in. I hope some of you married people had fun doing what I asked you last week—telling your spouse one thing that happened that day and how you felt about it. One wife complained that every time she asked her husband how he felt all he said was, “Hungry” and “how can you serve me?” So she’s not sure he’s actually been “getting” the point of the messages. 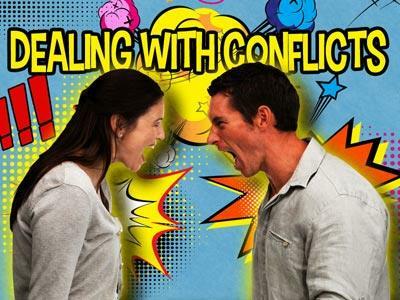 Conflict happens in all relationships, but especially marriage. So we’re going to talk today about conflict in marriage. Let me DISPEL A MYTH right from the beginning: good couples are not couples who never fight; good couples are couples who have learned to fight fairly; to fight Christianly. If you’re one of those starry-eyed engaged couples who feel like, “We never fight…” Veronica and I were like that, too. How blissful it is to be young and stupid! You just can’t get close to another sinner without there being conflict. Listen: The problems that split up marriages are not usually some special class of problems; they are usually generic problems (present in every marriage), but what happens is that one or the other partners don’t know how to handle conflict; don’t know how to keep minor problems from becoming major ones. Not a problem in their marriage, per se, but a problem in them. That’s why I told you the first week there are no married people issues; there are only individual people issues that get brought out in marriage. o Don’t want to admit? 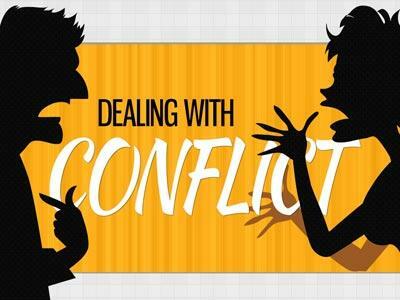 We’re going to look at two passages in Ephesians about conflict. The first one relates to conflict in marriage; the second to conflict in the church, because in either case the source of the conflicts the and solutions are the same. 5:25 Husbands, love your wives, as Christ loved the church and gave himself up for her, 26 that he might sanctify her, having cleansed her by the washing of water with the word, 27 so that he might present the church to himself in splendor, without spot or wrinkle or any such thing, that she might be holy and without blemish. Paul shows us God’s goal for our marriage and his pattern for achieving that goal. The goal is our sanctification (means, making something holy). The pattern for achieving that goal, for both of you, is the cross. The cross was about our conflict with God. We had irreconcilable differences with God and the cross is what God did about those. That’s how we must learn to respond in our marriages. If you want to understand why conflict is there in your relationships, what God’s purpose is in it, and what you should do during it, you have to understand this principle: one of God’s primary goals in marriage is making you holy; his means of doing that is by teaching you to wash the feet of and carry the cross for another sinner. The fact that you have conflict doesn’t mean you married the wrong person! Quite the contrary! The wrong person was the right person because God’s purpose was not just to make you happy by giving you a suitable marriage partner, but to make you holy by teaching you to wash the feet of another sinner who has disappointed you and sinned against you so that you could learn to love like he loves. Now, let’s go backwards in Ephesians, one chapter, because Paul is going to go into more detail there unpacking where conflict comes from and what to do about it, and you’re going to see this same principle at work. I’m going to highlight 3 commands Paul gives you for “how to fight” and then end by giving you practical steps.